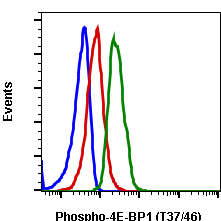 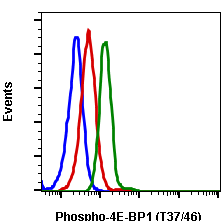 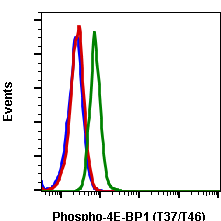 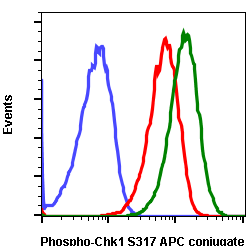 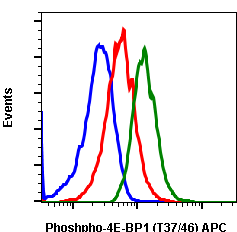 Flow cytometric analysis of Jurkat cells treated with LY294002 and unstained as negative control (blue) or treated with LY294002 and stained (red) or treated with TPA and stained (green) using phospho-4E-BP1 (Thr37/Thr46) antibody, 4EB1T37T46-A5 APC conjugate. Cat. 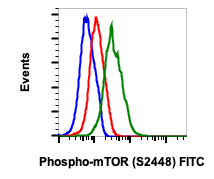 #2042.